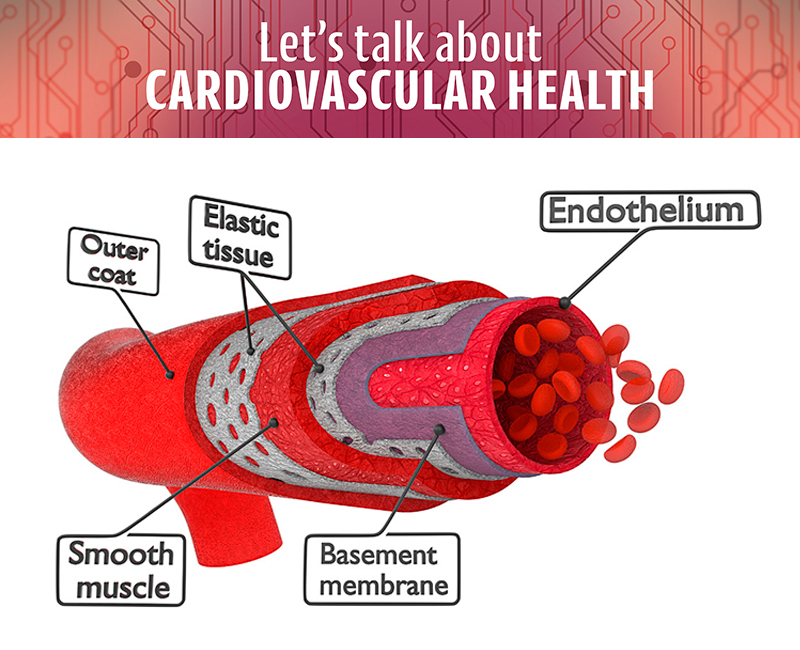 The endothelium is a thin membrane that lines the inside of the heart and blood vessels. The endothelial cells control vascular relaxation and contraction as well as the release of substances involved with blood clotting. Endothelial dysfunction refers to the diminished ability of the blood vessels to relax and contract. Endothelial dysfunction is also a predictor of atherosclerosis and therefore CVD[i]. The exact cause of endothelial dysfunction and atherosclerosis development is unknown however, there are certain risk factors including smoking, hypertension and high blood sugar levels, inactivity and weight gain[ii]. Various dietary modifications have been linked to an improvement in endothelial function. For example, cocoa flavanols have been shown to dose dependently improve flow mediated dilation through the relaxation of the endothelium as well as decrease blood pressure[iii]. Additionally, polyphenol rich aronia berry has demonstrated anti-inflammatory activity on the endothelial cells[iv] as well as improve nitric oxide production which relaxes the endothelium[v]. Eat well: A healthy diet can help lower your risk of developing coronary heart disease and prevent weight gain, reduce your risk of diabetes and hypertension. Aim to eat plenty of fruit and vegetables to ensure a high fibre intake which has inversely been associated with heart disease[vi]. Limit processed foods as well as those rich in sodium and sugar. Get Active: Physical activity can help reduce your risk of heart and circulatory disease. It can also help you control your weight and reduce blood pressure. Make exercise a part of your daily routine. Maintain a healthy weight: Research shows that reaching and keeping to a healthy weight cuts your risk of heart and circulatory diseases because it helps prevent and manage conditions like high blood pressure and type 2 diabetes that put you at greater risk of coronary heart disease. Quit smoking: Smokers are almost twice as likely to have a heart attack compared with non-smokers. If you smoke, stopping is the single most important step you can take to protect the health of your heart. Reduce Stress: Although stress is not a directly a risk factor for heart and circulatory diseases, but it's possible that it may contribute to overall risk level. Change your lifestyle in a positive way can help you feel better able to cope with the demands put onto you. A balanced diet, meditation and regular physical activity can help you cope with stress. Reduce Alcohol: Drinking more than the recommended amount of alcohol can have a harmful effect on your heart and general health. Alcohol is also high in calories so it can lead to weight gain. Current recommendations are not to drink more than 14 units per week and have some alcohol-free days within the week. Author: Aimée Benbow, BSc (Hons) ANutr. is Technical Director at Viridian Nutrition. [ii] Hadi, H. A., Carr, C. S., & Al Suwaidi, J. (2005). Endothelial Dysfunction: Cardiovascular Risk Factors, Therapy, and Outcome. Vascular Health and Risk Management, 1(3), 183–198. [iii] Grassi D, Desideri G, Necozione S, di Giosia P, Barnabei R, Allegaert L, Bernaert H, Ferri C. Cocoa consumption dose-dependently improves flow-mediated dilation and arterial stiffness decreasing blood pressure in healthy individuals. J Hypertens. 2015 Feb;33(2):294-303. [iv] Zapolska-Downar D, Bryk D, Malecki M, Hajdukiewicz K, Sitkiewicz D. Aronia melanocarpa fruit extract exhibits anti-inflammatory activity in human aortic endothelial cells. Eur J Nutr. 2012 Aug;51(5):563-72. doi: 10.1007/s00394-011-0240-1. Epub 2011 Aug 24. [vi] Wolk, A., Manson, J.E., Stampfer, M.J., Colditz, G.A., Hu, F.B., Speizer, F.E., Hennekens, C.H. and Willett, W.C., 1999. Long-term intake of dietary fiber and decreased risk of coronary heart disease among women. Jama, 281(21), pp.1998-2004.